Requires add-ons to carry out spell-checks etc. Most people think of Microsoft Word when it comes to word processing, but the software can be pretty expensive if it doesn't come as default. Try an alternative like AbiWord. AbiWord can read and write all standard industry document formats, ranging from open source efforts such as those created in OpenOffice, to those created in commercial apps such as Microsoft Word. It also features support for WordPerfect documents, Rich Text format documents, HTML web pages etc. Although AbiWord's editing options can't compare with Word, we like the fact that it is a very light word processor that doesn't take up much more processing power than even Text. This makes it especially suitable for those working on slower machines that don't have a decent word processor installed. What's also nice is that AbiWord is fully customizable with several different plugins to extend its capabilities. These can vary from format converters, document importers and thesauruses to image importers and a text format manager. AbiWord may be basic but it's generally an impressive word processing app that has everything you need to edit simple documents. This tour gives you a quick look into some of AbiWord's highlights. What use is a Word Processor when you can't share your documents with your friends? AbiWord is able to read and write all industry standard document types, such as OpenOffice. org documents, Microsoft Word documents, WordPerfect documents, Rich Text Format documents, HTML web pages and many more. Give your document that professional, scientific or fun-to-read look using AbiWord's advanced document layout options. Use tables, bullets, lists, images, footnotes, endnotes and styles to enhance the way your document looks. Since not everyone in the world speaks the same language, AbiWord comes in many different languages. AbiWord is available in most common and many not-so-common languages. Make sure your document contains none of those nasty spelling errors by using AbiWord's built-in spelling checker. Dictionaries exist for over 30 languages. AbiWord supports right-to-left, left-to-right, and mixed-mode text. This means that in addition to supporting European languages, AbiWord supports languages like Hebrew and Arabic as well. Do you also hate writing tens of thousands form letters by hand? With AbiWord's Mail Merge capabilities, you can let AbiWord automate that job for you. Special fields inserted into a template document can automatically be replaced with data coming from a variety of sources, such as Relational Databases, Comma Separated Text files or Tabbed Text files. 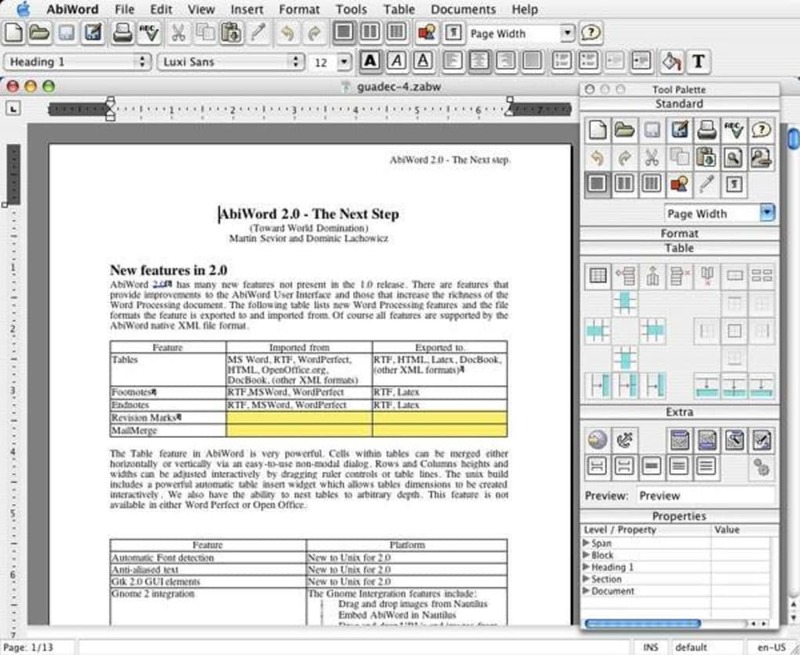 The plugin system was designed to give AbiWord all the functionality you might expect from a modern Word Processor. A variety of plugins can be used to extend AbiWord's functionality, ranging from Document Importers to a Thesaurus, Image Importers and a Text Summarizer. What do you think about AbiWord? Do you recommend it? Why?